The administration decided not only to continue with the clampdown on Internet for seven days but also to extend it to local cable channels for "preventing commission of offences". The communication clampdown was to prevent the dissemination of information by the Gorkha Janmukti Morcha to mobilise people, said sources. The unprecedented move to enforce the embargo on Internet, including mobile data, for a period of 48 hours was taken on Sunday after The Telegraph had reported that the scattered Morcha leadership was successfully devising strategies through WhatsApp. 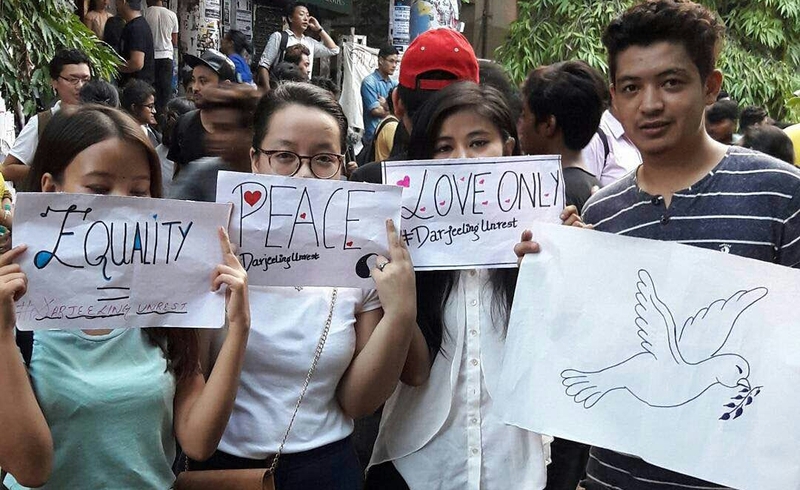 An order issued by Darjeeling district magistrate Joyoshi Dasgupta today extended the ban on Internet to seven more days and brought local television channels under its purview as a "last resort". 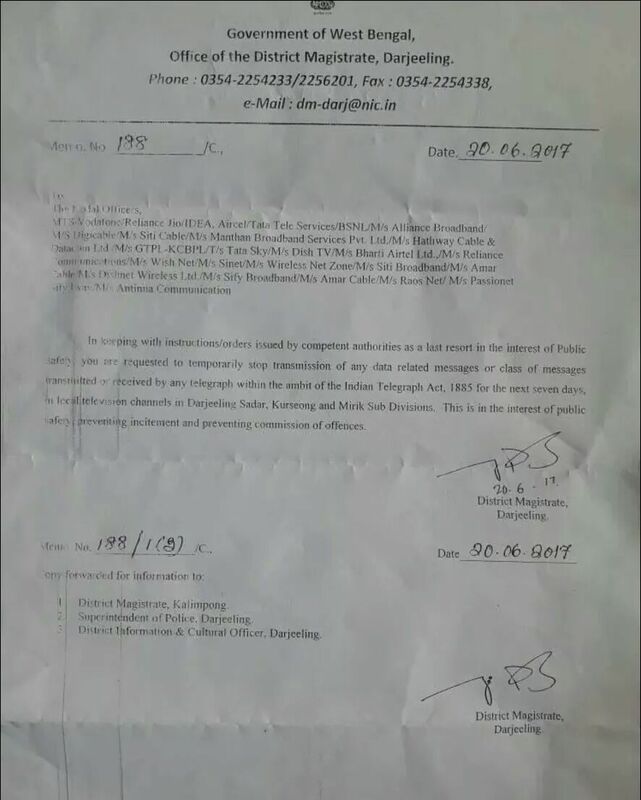 "As a last resort, in the interest of public safety, you are requested to stop transmission of any data... for the next seven days in local television channels in Darjeeling Sadar, Kurseong and Mirik subdivisions," the order, copies of which were sent to the offices of the dozen-odd local channels in the area, stated. "This is in the interest of public safety, preventing incitement and preventing commission of offences," it added. The order for the local channels, said the sources, was necessitated by a non-compliance of the local channels with a directive from the administration on June 8. The district information and cultural affairs department had sent text messages to local channels on that day to stop airing footage of skirmishes between Morcha supporters and police near Gorkha Rangamanch Bhavan here. The June 8 violence happened when chief minister Mamata Banerjee was present in Darjeeling, along with her cabinet colleagues. "In the absence of a written order, every channel had refused to comply with the directive on June 8. That is why a written order was issued this time. Live coverage and elaborate analysis of the agitation in the local media are counter productive in such a situation," said a source. There are over 10 cable channels in Darjeeling. The Morcha said the ban did not affect it, but accused the state government of trying to create a Kashmir-like situation in the hills. "It is foolish on the government's part to try this. The Internet ban has not mattered and the television ban won't either. We have other ways. Thousands of people are still coming out in our support everyday, aren't they?" asked Binay Tamang, the assistant general secretary of the Morcha. Local people said suspension of Internet had affected daily life substantially and basics such as banking had been dealt a body blow. A Darjeeling resident, who didn't wish to be named, said he had not been able to renew his crucial healthcare insurance policy with a private bank because the branches were shut and Internet banking was unavailable. "Banning Internet is silly and outrageous in this day and age," he said. The all-party meeting convened by the Morcha, attended by 14 hill-based outfits, also condemned the ban. P. Arjun, a Morcha spokesperson, said the meeting felt that the communication blackout was a violation of human rights and must be withdrawn immediately. 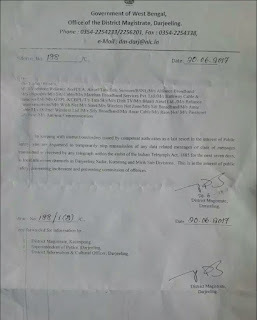 Although a copy of the order was sent to the district magistrate of Kalimpong as well, cable operators in the area said no notification was issued to that effect by the administration of the newly formed district till late this evening.